Chad Tackett claimed his weight loss program was so good that it was part of a university-sponsored study. That the study never existed was the least shady part of the tale. The Oregon-based weight loss company Fitera was founded by Chad Tackett in 1996 under the name Global Health and Fitness. His company, which claims to be the oldest internet-based weight loss outfit in existence, provides strategies for weight loss, tools to manage weight goals, recipes, workout suggestions, and an “online community” of support under the banner of its “Fast Track to Fat Loss” program. Here we will peel away the layers of a particularly egregious scam existing at the intersection of affiliate marketing and phony weight loss science. In doing so, we will expose a series of misrepresentations that were amplified and enabled by the burgeoning world of affiliate marketing and health “influencers”, but whose roots, we later learned, reach into the offices of real medical doctors and into the halls of a leading American research university. It is a tale told in four acts. The online marketplace for dubious health advice is — more frequently than recognized or admitted — often motivated by the same profit-driven forces that alternative medicine advocates, blogs, and self-described health “influencers” rail against. Take, for example, the natural health website of Dr. Eric Z (not a medical doctor), who along with his wife “Mama Z” created a company “to help people learn how to use natural remedies, like essential oils, safely and effectively,” and whose posts frequently criticize or call into question the profit motives of “big pharma” while citing conspiracy theorists such as Mike “Health Ranger” Adams. Looks like we innocently touched a nerve by sharing our friend Chad’s University of Arizona weight loss study during this past week’s newsletters. This one (in case you’re wondering) –> http://bit.ly/UofAWeightLoss. YES, it is University of Arizona sponsored. YES, there are medical doctors conducting the study. The first two “yes” statements were false, it turned out. The claim that Eric and/or Mama Z called the doctors’ office may be true, but if so, they certainly did not get a straight answer from that office. The doctors there did not appear to have anything to do with any active academic research project. 2 — Turn On Your Fat Burning Gene! 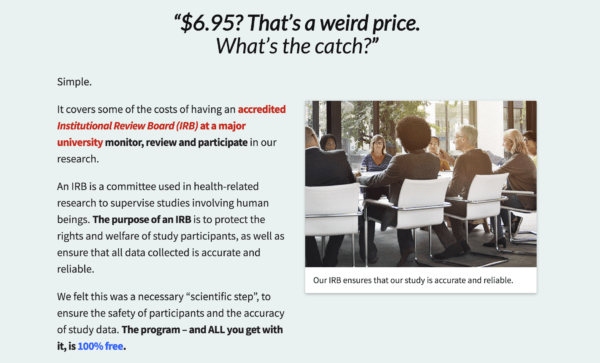 According to Alan C. Regenberg, the Director of Outreach & Research Support at the Johns Hopkins Berman Institute of Bioethics, charging participants to take part in a study is “not unprecedented,” but “it’s somewhat unusual.” The notion that the fees would be used to underwrite the work of an Institutional Review Board (IRB) was a different story, however. IRB’s aren’t actually involved in data accuracy and reliability apart from if they are concerned that the investigators aren’t competent when they’re reviewing the research … The IRB exists to look at the question being asked and the investigator’s experience and the methods they’re using to see if they’re all ethically appropriate and feasible and appropriate in other ways, scientifically appropriate. It is highly unethical (and logically incongruous) to promise any specific result through participation in a study. Still, Fitera’s page (like so many weight loss come-ons before it) made a series of grand claims about what their program was capable of: that participants would be losing weight while still being able to eat their favorite foods, no matter what their age or body type, and so on. By following their simple instructions, the advertisement stated, Fitera could teach anyone to “turn on” or “turn off” a genetic switch Tackett variously referred to as the “fat burning gene” or the “skinny gene” (although mention of the latter appeared to be motivated solely by its utility as a pun). While the concept of a genetic mechanism that promotes “burning fat” has existed in obesity literature for nearly a decade, Tackett misrepresented the science behind it completely, and his “Fast Track to Fat Loss” program, which we had access to after paying $6.95 and providing basic details such as age, weight, goals, and past efforts with weight loss, made no mention of the concept and did not provide any information on how a human could affect that genetic mechanism. “Eat healthy and exercise” would be the TL;DR version of Fitera’s pitch. We recently received the following email [from Snopes]. We have also gotten a few calls recently asking if we are a part of this weight loss program. As we haven’t heard from you in a while we aren’t sure if this is still something you are actively involved in. Our preference at this point would be for you to remove us from your website as we don’t want to mislead anyone if any of the statements on your site are not true. Tackett contacted us after Phelps made the request referenced above of him. “I’d first like to admit that some of the claims made on our ‘weight loss study’ page are misleading and should be revised or taken down entirely,” he said via email. “We’ve messed up in this respect and we sincerely want to make this right — as quickly as possible.” The study advertisement, it bears repeating, has been online since March 2016. Basically, they serve as added credibility — doctors that have reviewed our entire program and recommend it to their patients. They have not been compensated, other than their patients having access to our program. We initially set out to conduct a real study. We worked with two doctors/researchers (from the University of Arizona) — who have extensive experience conducting studies — to set up the study, get IRB approval and guidance, submit a grant to Grants.gov (so that we could offer everything to participants for free), and ensure that all information collected was accurate and reliable. 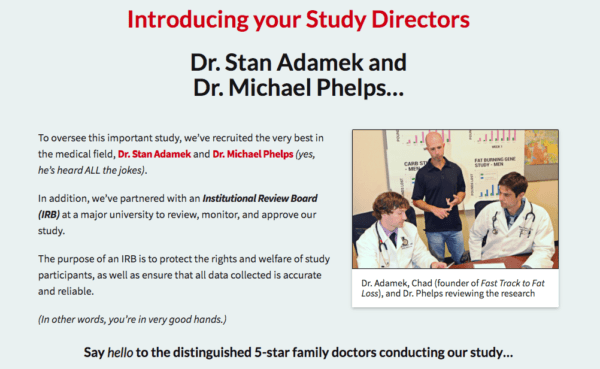 This is not an activity that is being conducted at or by the University of Arizona and we are not the IRB of record for anyone else conducting this study … It is not appropriate to charge IRB fees back to participants, and it is not acceptable to ‘promise’ anything as a matter of participating in a study. We are an accredited IRB and would not approve such language. 4 — The Response Was Overwhelming – Far Better Than Anything We’ve Ever Seen. We have extensive documentation of the advice given from these hired doctors/researchers, including correspondence with our web programmers to implement their advice in making all study participant information confidential, reliable, and unbiased. I’m happy to share this with you. We also have signed consulting agreements with these doctors/researchers and the IRB approved the review of the de-identified data by the doctors/researchers. To Tackett’s credit, he did provide us with extensive documentation attesting to the fact that he paid professor Douglas Taren, the Associate Dean for Academic Affairs and a Professor of Public Health at the University of Arizona — as well as Taren’s wife, Myra Muramoto, a medical doctor and the head of the University of Arizona’s Family and Community Medicine department — consulting fees, ostensibly with the goal of creating a legitimate study. But far from demonstrating that he made a good faith effort at designing a study, the correspondence Tackett provided to us (which spanned a period from 14 August 2015 to 9 September 2016) shows that he was myopically focused on the appearance of legitimacy, and that he either willfully or neglectfully ignored several messages informing him that his brief collaboration with Taren et al did not mean that his study was approved of, or in any way sponsored by, the University of Arizona. The UA IRB approved the review of de-identified data by Dr. Taren only. IRB approval was not given to the company [Fitera] for collection of the data and use of the UA name is not permitted on any company materials or distribution related to the study. The UA IRB also is not guiding or instructing how you collect your data to begin with, as that was not part of our review or determination. At this time, if the UA logos have been taken down then that is sufficient. I, however, really question whether the project needs IRB oversight from another IRB (there are plenty of commercial IRBs that would be able to provide a review). If the company thinks the UA IRB approval covers their actions then that is incorrect. We are only covering Dr. Taren. 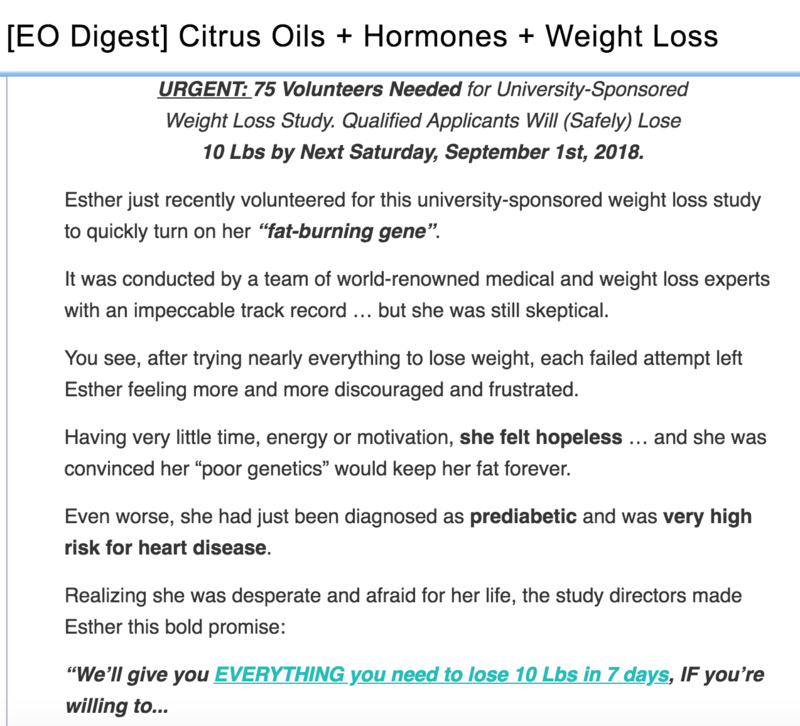 As I mentioned in our call, the response we received to the recent “interested in participating in a weight loss study?” email we sent out was overwhelming — far better than anything we’ve ever seen. So it got us thinking — instead of selling our program for $47, we could give it away when they sign-up for our new weight loss study at just $7 for a study “processing fee” … But we don’t want to just say we’re doing a study without really conducting one that is accurate, reliable, and implemented in a way that people in your field would consider “legitimate”. I’m still a little vague about what is meant by the ‘U of Arizona subcontract’ bit, but if you could confirm in writing (i.e. an email) with Doug that this clause will allow us to use the UofA name/brand on our study enrollment page, that should be fine. The offer/sales pitch idea came first, and then we set out to make the study a real thing. We have all of the data we were advised to gather as part of the study, but we haven’t analyzed it yet, as we have not resumed the process since things fell through initially. While this “study” deceit may be small potatoes compared to other forms of corporate fraud, it highlights with comic effect the absurdly low bar set for material shared by an influencer when there is (as was the case for Eric and Mama Z) a financial motivation to share it. In addition to people being potentially harmed, this sort of thing poses a risk of harm to research as an endeavor because research with human subjects is really important, they learn a lot of things from it, and moving ahead with people participating and human subjects research particularly more than minimal risk research requires trust, transparency, [and] credibility, and these sort of fraudulent activities eat directly away at that. Dr. Eric Z. 31 March 2018. New Scientist. 20 August 2015. Fitera. Accessed 18 September 2018.